I suppose that shouldn't be news considering I live in the Midwest, but we haven't gotten a really big snowstorm in a couple of months. We're supposed to get about a foot over the next couple of days. When it snows, we LOVE having big breakfasts. Pancakes, waffles, french toast - there's just something about a snow day that calls for a good old-fashioned, homemade breakfast. 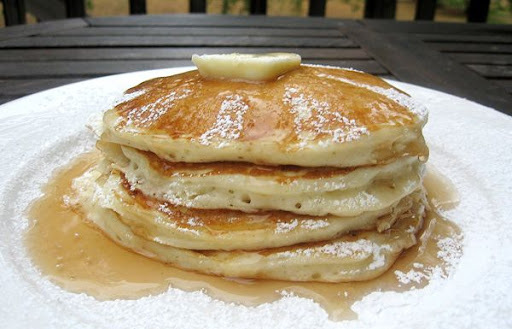 It took me a couple of years to come up with this recipe for Buttermilk Pancakes. In all the recipes I'd tried, I'd just never found one that was right. I wanted a melt-in-your-mouth pancake that was light and fluffy and bounced when you pressed on it. Like the kind of pancake they serve at your favorite late-night diner. The buttermilk in this recipe, along with the number of eggs is what makes these pancakes the perfect consistency and flavor. The eggs provide the bounce, and the buttermilk gives them a richness and depth of flavor that you can't get without it. You can, however, substitute 1 cup of milk + 1 tablespoon of vinegar for each cup of buttermilk if you don't have it on hand. The flavor won't be the same, but it will be close. SO, if you're snowed in, and want a new, really delicious pancake recipe to try (for breakfast OR dinner), here's one for you. They're melt-in-your-mouth good and sure to give you all the energy you need for shoveling, shoveling, and more shoveling! In a large bowl, combine flour, sugar, baking powder, baking soda, and salt. Set aside. In a separate bowl, beat together buttermilk, milk, vanilla, eggs and melted butter. Keep the two mixtures separate until you are ready to cook. Pour the wet mixture into the dry mixture, using a wooden spoon or fork to blend. Stir until just blended together. Do not overmix! Scoop the batter onto the griddle, using approximately 1/3 cup for each pancake. Cook on both sides until golden brown. Serve with butter, syrup, and powdered sugar or fruit preserves. I LOVE a great pancake! I'm one of those East Coasters who is expecting another foot of snow tomorrow, so we may just have to make these. I'll pick up some buttermilk on the way home from work today. They look delicious! I've tried the lemon juice/baking powder/vanilla trick before, but I'll have to try your recipe. And here in the Mid-Atlantic, we're supposed to get another 10-15 inches on top of the 27" we just got. mmmm, I will have to try this! I love pancakes when I eat out but I can never figure out how they get so fluffy and lite. mmmm... we love pancakes, especially with blueberries or chocolate chips. I must confess more often than not ours come from a box which says, "just add water" but I will have to give this from scratch recipe a try... especially since we're getting another blizzard heading our way!!! YUM! I loved my mom's buttermilk pancake recipe as a kid, but I made it recently and it just wasn't as good as I remembered. We'll have to try this one! Also--roughly how many pancakes does this make? It looks like it makes a lot of batter! This recipe makes about 20-25 4-inch pancakes. It is a lot of batter, but I like to make more than we need for one breakfast so that I can reheat them and use them throughout the week. You could easily half this recipe if you wanted to just make enough for just one meal. We do pancakes a lot here on weekends. I usually use Trader Joe's multigrain mix or their pumpkin mix when it's in season. yummo! Absolutely delish! Did make a lot, but much much better than the bisquick I normally use. They were so light. Thanks for sharing! WOW...these were sooo yummy! I've tried several pancake recipes that always flopped. These were so light and fluffy with just the right amount of sweetness.My husband declared them the best pancakes he's ever had! It did make a lot of pancakes, but now we have breakfast for the week or I might put some in the freezer. Thanks for sharing the recipe! I never leave comments on blogs BUT I've been looking for a great pancake recipe for years and these are definitely the best I've ever made. Light and fluffy not flat and heavy and yes just the right sweetness. I can't wait for the rest of the family to taste them. This recipe does make a lot but they can be frozen, but I highly doubt there'll be any left to freeze! Brava to you and thanks for sharing this easy and delicious recipe ! YUM! I gave this recipe to my husband to make for dinner tonight (he's the resident pancake-maker around here) and they were DELICIOUS! We halved the recipe since it was just the two of us, and that worked out well. 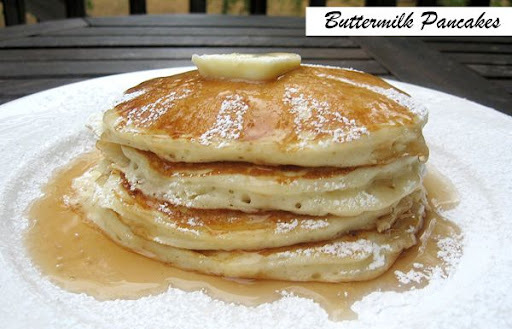 With other buttermilk pancake recipes we've tried, the buttermilk has been so obvious as to be almost sour, but this was much better. A little sweet, a little tangy, and very fluffy...we'll definitely be making them again! These pancakes are fantastic! This is my second time trying to find a homemade pancake recipe, I was just about to give up on making homemade pancakes until I found your recipe (light and fluffy)! Thank you so much for sharing, my husband really enjoyed breakfast this morning. Your recipe is officially my families recipe:) Thanks again!